the cylinder and valves. Worth getting rid of, probably. The humble WD 16H Norton is one of the least pretentious of motorcycles. In standard form, it is slow enough to make riding on the roads awkward. However, it can be upgraded, quickly and simply, at low cost. With the suggested modifications, it will have much better torque, a cruising speed of 60mph and above, and a top speed of 80mph. 70mph can be maintained for long periods without undue drama. The standard appearance is retained, except for the exhaust. The standard cams are also retained. The modifications take advantage of the fact that Norton knew their way around sidevalve engines very well indeed - no Ricardo patent needed for Norton; they already had the pop-up piston giving the potential for a good breathing/compression ratio balance vital to a sidevalve. No originality is claimed for any of these modifications: all have been copied from other work and other modified motorcycles. A good source is anything written on the racing Harley Davidson WR45 - these sidevalve engines were heavily developed. Quite a lot of on-line information is available for these engines. There is no point in attempting any of the modifications described unless the engine, gearbox, forks, brakes and cycleparts are in good order. As the bike will be faster, it needs to be in good condition. The standard carb is 1 inch. Change this for a 1 1/16 inch as per Model 18, along with the Model 18 inlet stub. This makes the inlet tract parallel, not ideal, but better than expanding from the carb onwards, as standard. Stainless steel racing valves intended for Chevrolet V8 engines can be bought at reasonable cost from any shop selling aftermarket parts for American V8’s. Standard size for the exhaust, and 1 ¾ inch for the inlet, ⅛ inch bigger than standard. These valves come in the right size of stem for the existing guides. Collets and lash caps should be purchased with the valves (you may have to buy a set of eight, lifetime supply!) and installed: the tappets will then have enough adjustment to close the gap to the slightly shorter stems on the Chev valves. The standard 16H springs seem fine, but use of NOS items is advisable. 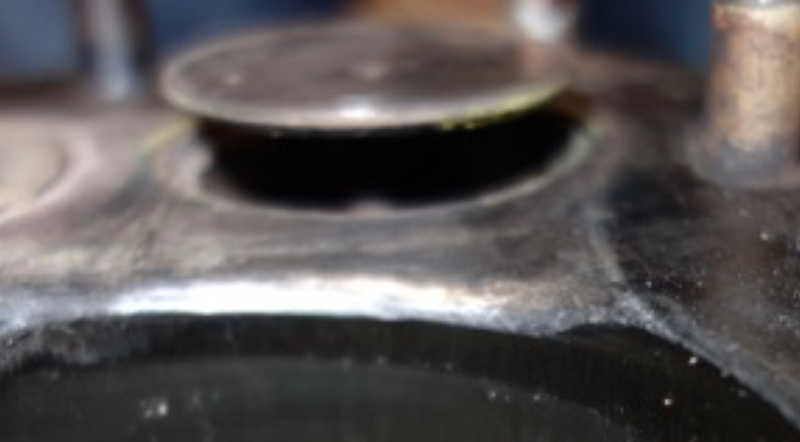 Close-up of area around the 1-¾ inch inlet valve. to deal with, without unduly compromising the compression ratio. The larger inlet valve facilitates a good three-angle re-cut of the valve seat, and allows the bowl and tract to be cleaned up - just grind off the obvious flaws, lumps etc - do not try too hard in this area. The exhaust is already too big so don’t bother, except to recut the seat. When re-cutting the inlet seat, recess it a little and relieve the area around it next to the cylinder head. This lets it match up better with the inlet relief in the cylinder deck. The valve is recessed so the top is level with the deck: no special science, just unwillingness to go too far. Hopefully this can be seen in the photos and the drawing. The standard cams seem OK, for this extent of modification. No doubt more could be done with modified cams, but this would be serious development, moving away from the keep it simple, low cost philosophy. Remove about 2mm or so off the head - on the head in the photos, the head is taken back to the level of the underside of the fin. Ensure the mating faces are flat, and use copper coat aerosol gasket for assembly rather than a gasket to increase compression. A substantial gain in compression ratio is needed, as the next modifications to improve breathing sacrifice some of this. Check that the valves have clearance to the head at full lift: about 1mm is fine. Grind out the head just over the valves if the clearance is not enough. 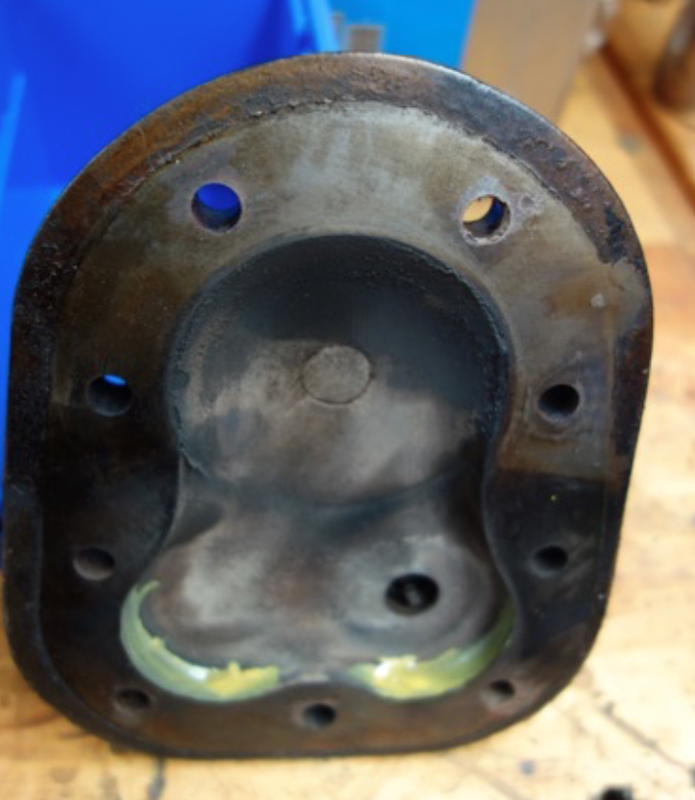 Grind the head so the combustion chamber is fair and smooth – take out the bare minimum of metal to do this - seek only to remove undue roughness in the casting. 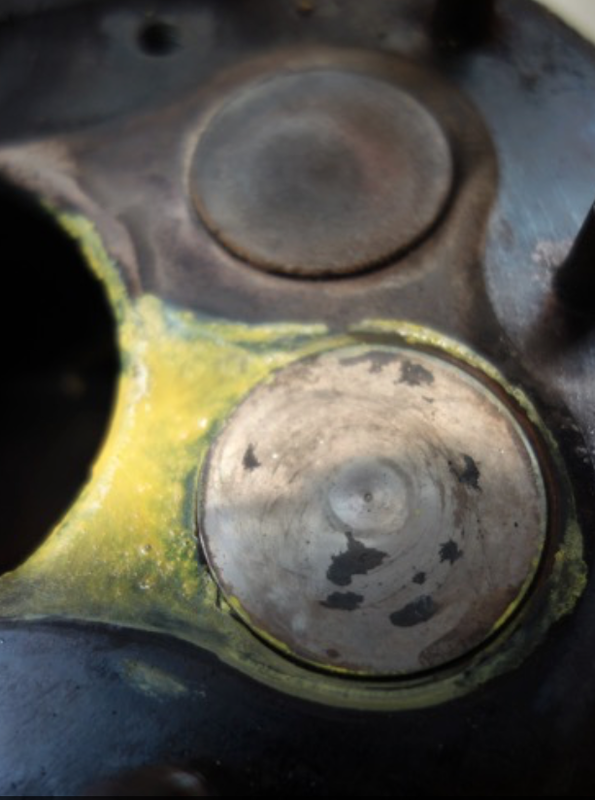 Make sure the combustion chamber does not impinge on the piston at TDC - grind some clearance if so. 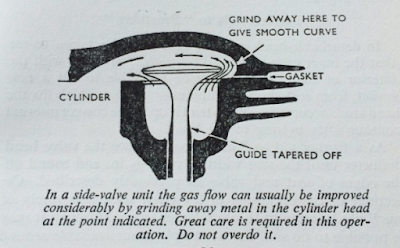 Relieve the cylinder head behind the valves – “Tuning for Speed” has a good drawing of this (above). There is a lot of variation between 16H cylinder heads: no two seem alike, so judgement must be used in these modifications. Now, grind a pathway for the inlet gasses from the inlet valve seat to the cylinder bore. This was 5/64 inch deep at its midpoint on my bike. This modification is hard to explain in words: hopefully the photos are clear enough. Don’t make these so deep that you grind through the casting: however there is a fair bit of meat to work with. The exhaust was given no relief, as it was thought not to offer much advantage. 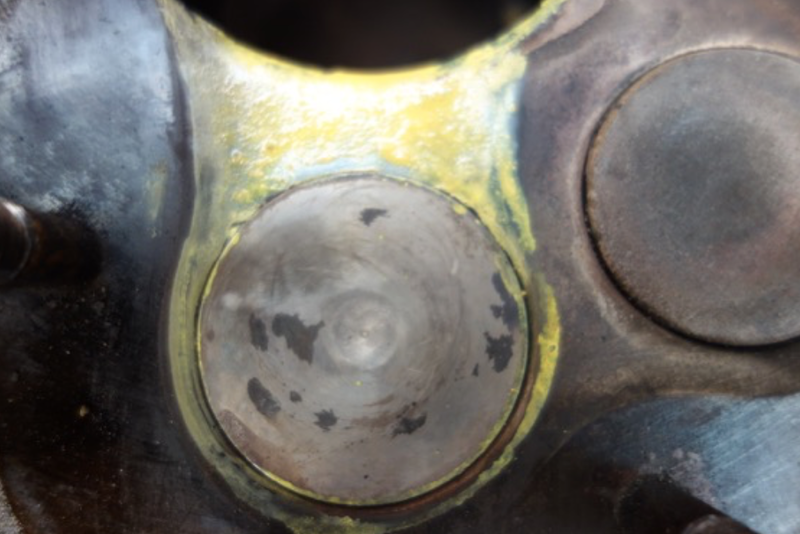 Round off the top edge of the cylinder wall facing the valves – not so much that you expose the top ring unduly. With these modifications, some of the gain in compression ratio will be lost. In sidevalve tuning, it is a matter of striking the right balance between compression ratio and breathing, with the object being to get the highest compression pressure when running. The shape of the combustion chamber between the valves and the cylinder has a significant effect on breathing, being in effect a restrictive part of the inlet and exhaust tract. This balance is the reason the famous Harley sidevalve racers of the past ran CR’s well below 7:1. Striking this balance is a matter of trial and error, and doubtless results will vary depending on the artist’s interpretation. The standard 16H exhaust is too big. Replacement means fabricating a new pipe, and this does move a little away from the standard appearance. The exhaust on my 16H works well, the pipe size is 1 ½ inch OD. The length is 1500mm from the port to exit of the muffler. The muffler is a straight through item, rather like a Burgess, which can be found in the carpark at any Vincent Owners Club meeting. Failing this, you can buy one cheaply from the aftermarket shop along with the valves. My exhaust was arrived at by happy accident many years ago. The bike’s exhaust had passed its use-by date, and a friend made me a new one, a quick job to get back on the road. 1500mm is about as long as you can fit on the bike. With no other modifications at this stage, performance improved noticeably. The WD 16H will benefit from a lot more ignition advance than book standard. However, the final figure will vary from machine to machine, depending on how the combustion chamber turned out. The best way of establishing this is to set a lot more advance than one would expect – well over 50 degrees. Then use the advance/retard lever on the road to find out how much advance your particular bike can comfortably use, and set it at that. Within limits, the bike is not unduly sensitive to ignition timing in terms of performance. There is quite a range over which the engine seems to run well. There might be a temptation to use the minimum of advance that gives good running. However I have found that the maximum advance that gives good running gives a much cooler engine, important in a sidevalve. This only becomes obvious on longer runs. You then have to use the retard if you wish to lug up hills in top, providing more entertainment of course. The standard jet, 160, albeit in the bigger carb, seems right for New Zealand 95 octane unleaded fuel. Fuel economy is a bit over 50mpg in oldspeak - OK for a sidevalve. Normal tuning procedures for establishing main jet size apply. Installing a Model 18 engine sprocket - 18 teeth from the standard 16, is a must. The bike will pull this gearing with authority, and will be much smoother to ride. Even with the modifications the bike seems to be almost governed to 80mph, at which point it is well under 5000 rpm so safe for the cast iron flywheels. My 16H, with the modifications as suggested, undertook a 2000 mile round trip from Auckland through the South Island of NZ and back. A footrest came slightly loose, and at one point I had to drain some garbage from the carburetor bowl. That was it for faults, and the longest day’s ride was over 400 miles. The route was largely over hilly and winding roads. The bike was a pleasure to ride due to its agility and torque. Compression: Having milled the cylinder head down to the fin, there is still quite a bit of room between the piston and head – approx. 0.180 inch on my bike. This could be reduced to about 40 thou or so over the half of the piston away from the valves by bronze welding and machining. Raising the compression ratio in this fashion would provide a degree of squish to the benefit of combustion. It would also allow some sacrifice of ratio to further relieve the restrictive area between the valves and the cylinder. Spark Plug Location: The original location appears to have intended to be kind to the sparkplugs of the day. The plug could be moved to approximately the centre of a triangle made by the valves and bore, for improved combustion with reduced advance. Either a new rebate in the tank or a 10mm plug would be needed. This also allows a longer reach plug as the electrodes will not be smacked by the inlet valve. The final position of the plug would have to take into account any revised combustion chamber shape. Cams: This is an obvious one, but starts to get into expense and some design effort. The limitations on pre-war cam design seem to have been governed by the durability of the coil valve springs of the day. Valve springs have moved on, and if anyone is inclined to use one of the cam design applications, an improvement without loss of desirable low-end torque or reliability should be possible. Carburettor: You could go bigger than the 1 1/16th inch carb recommended. I mentioned that the modified 16H seems governed to 80mph, the same speed as the Model 18. It is speculated that the governing effect is due to the carb size. Of course, cams and carbs raise the possibility of increased revs, so the cast iron flywheels, happy at under 5000 rpm, are potentially at risk. Steel flywheels would start to look attractive. I have a clip-fitting 1 3/8 TT carb I am tempted to try, restrained from this only by the laughter of friends. One advantage of a bigger carb would be the potential to improve the inlet tract; straight-sided with the 1 1/16th inch carb. Combustion chamber shape: There is an on-line illustration somewhere of a sidevalve cylinder head by Prof Gordon Blair - this requires a flat top piston and probably a revised head casting - relatively simple in aluminium alloy. This seems to offer an improved combustion chamber shape. The Professor also shows a three-valve version. It is not my business to repeat any of this here, except to recommend a look. Updraft Carburettor: As used by the famous Norton sprint 16H, in the article on this site. This has been used on an Australian BSA M20, made by cutting and welding, and has obvious gas flow advantages. This moves the appearance so far from standard as to be eccentric, of course. Longer Inlet Tract: along the same lines as the updraft, but less radical in appearance. 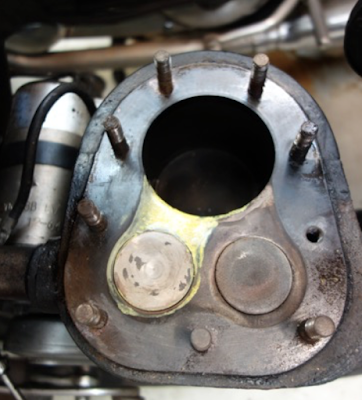 If the inlet port could be altered so the carb missed the oil tank, or indeed if the oil tank was modified, a good long inlet tract, like a vintage sidevalve TT Sunbeam, could be tried. A suitable length to match the exhaust, any modified cam, and carb size would have to be established. There is plenty of theory on this for a starting point. Should anyone try any of the extra modifications, or other ideas, I would be most interested to hear of the results.